Corinthian Colleges, Inc. (CCi) was a large for-profit post-secondary education company in North America. At its largest, CCi had over 100 Everest, Heald and WyoTech campuses throughout the United States and Canada. Corinthian's campuses in Canada closed on February 19, 2015 after the Ontario government suspended their operation license. After a series of legal challenges by state and federal agencies, on April 26, 2015 Corinthian Colleges announced that they would cease operations at all remaining US locations effective April 27, 2015. The closure affected more than 16,000 students and employees. 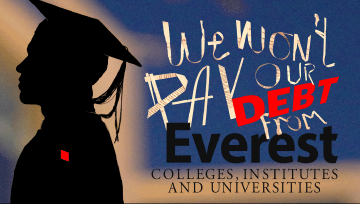 Students of Corinthian Colleges have declared a debt strike by refusing to pay their federal loans. State of California class action suit (2008) - Leask, Et Al V. Corinthian Colleges, Inc., Et Al.